The SX.100 is brand new and part of the 2018 collection. This Premium ATR Lightweight Thermoplastic Helmet is completely handmade in Portugal. It features a large, retractable sun visor, so you can ride safely in bright conditions. 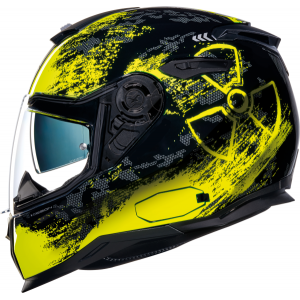 It has ADS (Air Dynamic System) venting with a large intake at the top, front of the helmet and a dual vented exhaust at the rear. It has another vent at the chin, so that you can regulate the flow of air to your face. The retractable sun visor is easily operated by a slider on the left hand side of the helmet. The SX.100 comes with a quick release X-Swift clear visor, plus a Pinlock anti-fog visor insert as standard, so your visor won't mist up in the colder months. This new full face can even accommodate the X-Com Bluetooth intercom (sold separately) flush to its shell, retaining the stunning lines of the helmet.